The hot and cold fishing in Sooke this season seems to be hot once again. 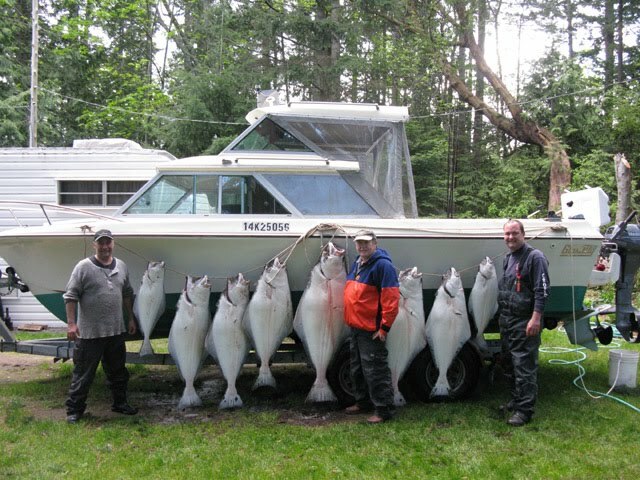 Spring salmon are being caught more regularly. Also, sockeye is now open for fishing. Neil from Salty Towers Oceanfront Resort sent in this photo, after a quick fishing trip today with a limit catch at Possession Point in just over an hour. Big Fun Ahead indeed! Sockeye catches have been reported over the past week, but they couldn't be kept. Today, they can! One report said he found them out in 350-400 feet depth right out front of Sooke Harbour mouth. Once you find the school, it's great action ... and you can't beat sockeye for dinner table. 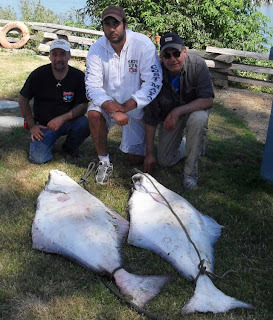 For halibut, Serge sent in a couple of photos of his catches in the Jordan River area, two over 100 pounds caught in July, and 8 halibut up to 100 pounds caught in April.